The football season is over once again. But the World Cup will soon be underway. Rumours already abound as to who will be leaving one club for another for ridiculous amounts of money. The transfer market has highlighted the differences between the super rich clubs and the regular clubs. This state of affairs mirrors the way that the world is now. The gap between the rich and poor has grown larger and the cataclysm in the financial worlds seems to have failed to effect the changes which are necessary to make sure that some form of equality is achieved. Over the last two decades I had become totally disenchanted with what the professional football game has become: money dominated. Yet over the last 14 years I have been working on a project, Spirit of the Game, which includes the life story of a footballer who was my only childhood hero and for whom enough was plenty. When I was seven years old, I was asked, “What are you going to be?” I replied, “I am going to be an artist or I am going to be Stanley Matthews”. Eventually, I have become recognised as an artist and this in turn has allowed me to fulfil the other part of my naïve prediction. I have written a script which has allowed me to engage with and give a voice to the life of Stanley Matthews. It truly has been a privilege. Everyone that I have met along the way who would enthusiastically tell me a story about Stan has initially said, “What a gentleman”. And that’s a good place to start. Because that gentleman embodied qualities of sportsmanship which are sorely needed in the modern game. And modern life, perhaps. He played for 35 years and was never cautioned even in the face of some extreme physical provocation. Clearly his personal integrity and humility formed the bedrock of his sporting psyche. 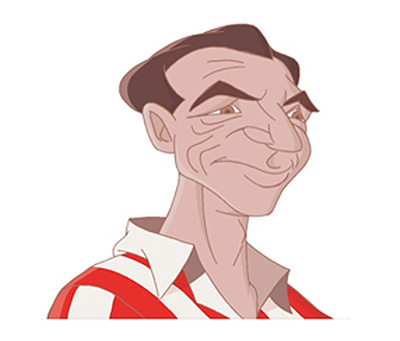 Stanley Matthews was the world’s most famous player. Bigger than Beckham or any of those who had sought publicity and had their reputations created by the multinational media machine. He was, arguably, the greatest player of his time (and probably of all time), who embodied the spirit of the ‘beautiful game’. He was born in 1915 and finished his playing career in 1965 and, even then, he felt that he had finished too early. He was constantly playing at the highest level and his last international appearance was at the age of 43. Central to this incredible continued sporting longevity was Stan’s careful consideration of his diet and training methods. He was introduced to the idea of the importance of diet by a vegetarian osteopath called Arthur Milward, who made him aware of the benefits of fasting, which he would do every Monday. But it was Stan’s own personal reading and study of diet which refined his understanding to the point that he could outlast and outpace his contemporaries and many much younger men. The technical side of nutrition is now a critical part of the modern game of football. Stan produced his own carrot juice and was the icon for Bio Strath, the Swiss herbal fortified elixir. In later years he also became an exponent of reflexology. But his greatest influence was in the way that he transferred to others, and cultivated in them, his love of what he called “The Beautiful Game”. He was a boy from the Potteries whose first wage packet had been £1 a week. At the height of his powers, he earned £20 per week. When he finally retired Stan was on £50 per week and yet was the world’s greatest ambassador for the game he loved. Possibly, it was the fact that his status came not from riches but from reputation that allowed those who watched him and those he taught to identify with his enthusiasm and enjoy the game at whatever level they were able to play themselves. He spent 25 summers in South Africa and played no small part in developing the enthusiasm that men and women there now have for the game and for the life-changing influence it has in their lives. Archbishop Desmond Tutu credits him with having dented apartheid. The story of his involvement with African football is told in my book Stanley Matthews – The Black Man With the White Face. Prior to this, my young adult’s novel Spirit of the Game was published in 2010. 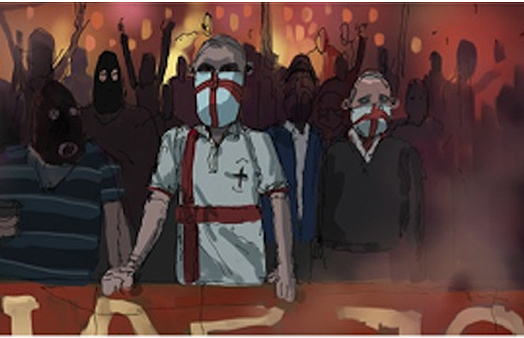 The storyline seeks to tells Stan’s story in a fictional form and engage with a number of issues which are divisive elements within our society today, particularly focusing upon racism and anti-social behaviour. The tale unfolds against the background of football (which has enormous global influence and provides ‘role models’ for countless young people). The story challenges endemic racism in a way that hopefully invites readers to reflect on the prejudices they might hold. Since then a Spirit of the Game initiative has organically grown around the novel. The other flagships of our campaign are a groundbreaking educational programme, a beautifully-crafted interactive animated graphic novel, a unique 2D animated movie plus an animated tribute to Stan Matthews. The whole project, with its underlying theme of peace, respect and compassion, is currently under consideration by the UN Office on Sport for Development and Peace. The novel was picked up by leading alternative educationalist Lin Porter and turned into a groundbreaking educational programme, which has been successfully piloted with a number of troubled children and also run as a summer school to great acclaim at the Nishkam School Trust in Birmingham. The film, Spirit of the Game, plus its animated graphic novel alter ego, will take traditional 2D animated filmmaking to new areas of socially-relevant expression and creative storytelling. It will do so in a way that only the very best of award-winning, British live-action dramas can do – yet with the added dimension of mature hand-crafted animation, far removed from a traditional ‘cartoon’ norm. The Spirit of the Game team commands an amazing range of talent including BAFTA-winning director and animator Tony White, award-winning artist and author Geoff Francis, leading animation professionals (ex Disney/ Pixar/ Dreamworks) and voiceover artists including RSC actor Patrick Robinson (popularly known for his role in Casualty and his appearances on Strictly Come Dancing). 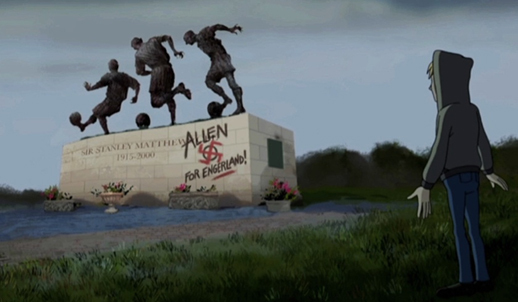 Trailing the film will be a short animated homage to Sir Stanley Matthews, to be released for the centenary of his birth in February, 2015. 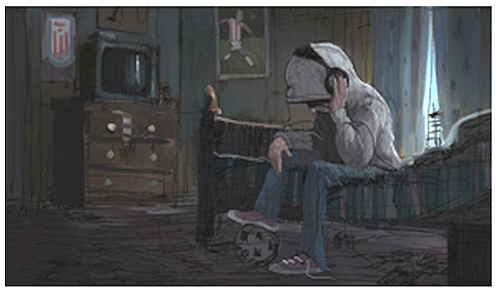 This new traditionally-animated short provides a rare insight into the life and world of not only one of the finest soccer players ever – but also a very fine human. It’s been a fascinating journey so far and it is by no means over yet. Every time, when I have (foolishly) thought there might have been nothing further on the cards for Spirit of the Game, I would be prompted by another of the many ‘coincidences’ that have been constant companions on this particular odyssey. I have often been minded to consider them as some form of ethereal prompting from Stan. This entry was posted on 29 May, 2014 in homepage and tagged animated 2D movie, Archbishop Desmond Tutu, Arthur Milward, Bio Strath, Brian Clough, David Beckham, David Stanton, diet, fasting, football, Geoff Francis, Gianfranco Zola, Hero, Lin Porter, Nishkam School Trust, nutrition, Patrick Robinson, Pele, refloxology, South Africa, Spirit of the Game, Stanley Matthews, Stephen Hanson, The Beautiful Game, The Black Man With The White Face, the World Cup, Thomas Liera, Tony White, UN Office on Sport for Development and Peace., vegetarian osteopath. Bookmark the permalink.